This release is again focused on performance increase of the kernels and bugfixes. However, the most code intensive change in this version was the new workload dispatcher as it's part of the the oclHashcat core. The old one wasn't that bad, but the new one is simply faster which adds up to the increased performance of the kernels. There's also one change made to the binaries itself. We now are using our own toolchain (thanks to crosstool-ng) to create our own binaries with an older glibc. That was required to make the binaries compatible to linux distributions using an older glibc. That means you should be able to run cudaHashcat and oclHashcat now without glibc patching on The-Distribution-Which-Does-Not-Handle-OpenCL-Well (Kali), some (older) Debian systems, CentOS 6.4, etc..
Skype and Peoplesoft are just new parsers as you were already able to crack them with older oclHashcat versions by using the generic hashtypes and by formating the hashes in a way that oclHashcat can load them. By adding parsers we just make it more comfortable for the users to load the hashes as you can use them in their native output. 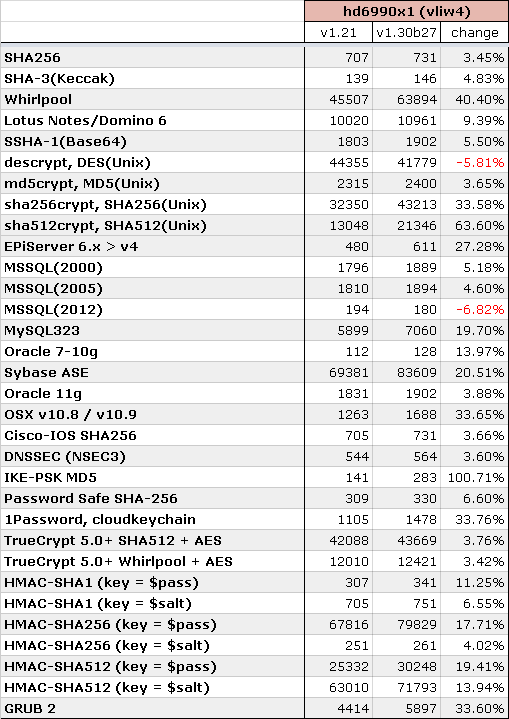 The md5($salt.md5($pass)) generic algorithm was simply added as it was required for the Mediawiki B type hash-type. It's a simple scheme that does not require any special comment. The Kerberos 5 algorithm is a reimplementation as fast algorithm type. That is the case if an algorithm is fast enough to require an on-gpu candidate generator. 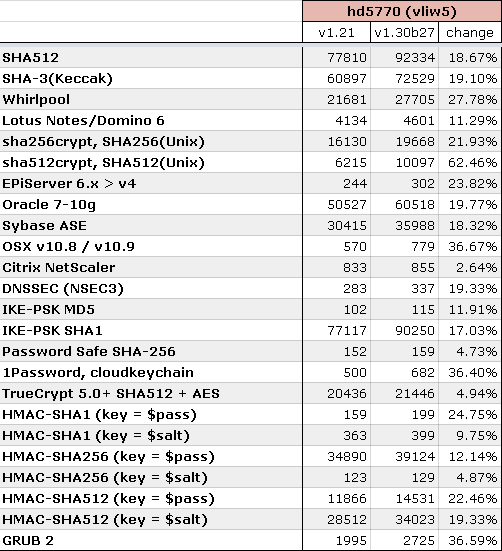 The algorithm actually was fast enough and just by not selecting it as fast hash it lost some performance. By switching it to a fast type we got some speedup for free. That's why we've added scrypt to GPU. And what should I tell, it's PITA. The goal of scrypt to run slow on GPU has been fulfilled. Just one note about that. The intention (if I understood currectly) was to make the computuation slow because the memory access is slow. Well that's not what made it slow actually. It's simply the lack of the total memory available on the card. 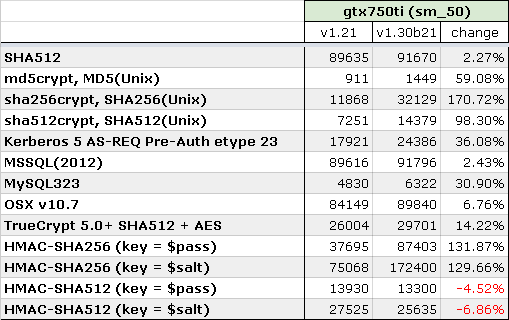 Note that, to run fast with GPGPU, you have to run many tasks in parallel. That means that you have to allocate a huge amount of memory for each parallel task and this is what kills the gpu, not the access time. Also note that this scrypt variant is the real scrypt, not the minimal version that is used for litecoin. The litecoin version uses extreme low settings for N, r and p such that it is not required to work on global memory for all operations. We're using a fully functional scrypt in which you can set N, r and p dynamically. 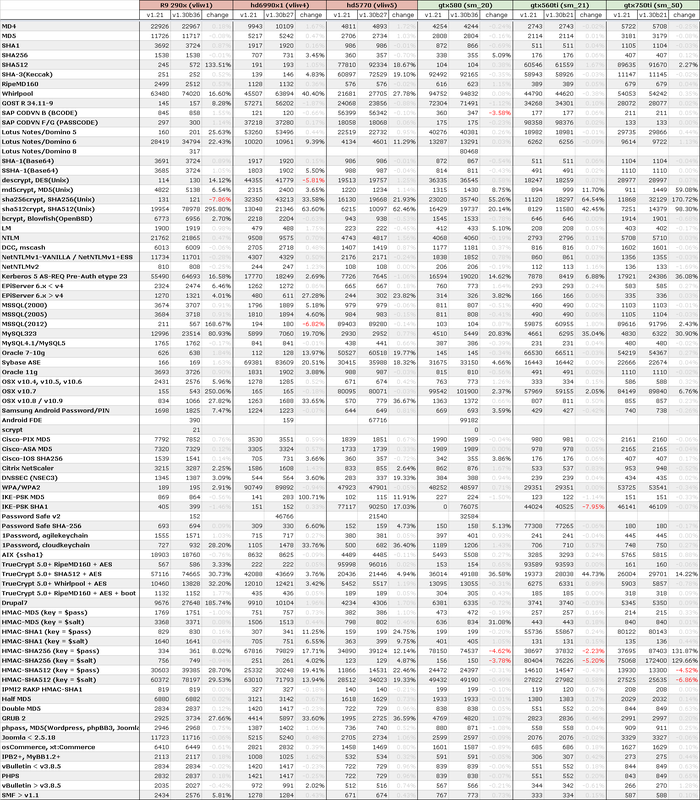 For the benchmark, we're using the defaults of 16k, 8, 1. 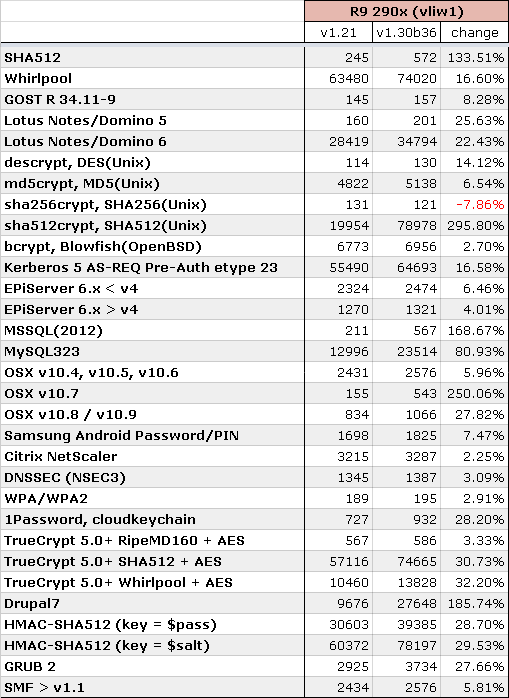 The Password Safe v2 was also very interessting. 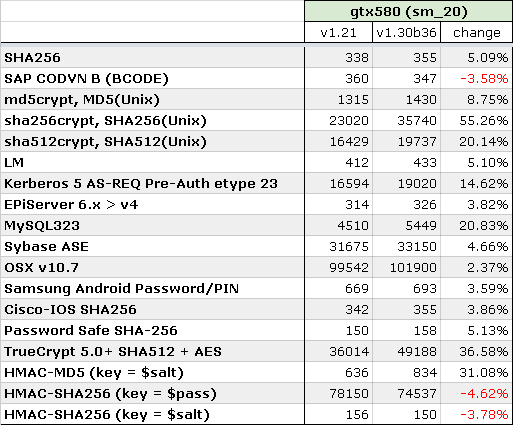 This algorithm actually runs slower than the current one used in Password Safe v3, which is also supported with hash-type 5200. On my AMD hd7970, the v2 version runs with 101 kH/s while the v3 version runs with 506.2 kH/s but I don't think it's too much of a problem. Both run slow enough and are salted. We've added some very special GPU type specific instructions that gave the speed boost. 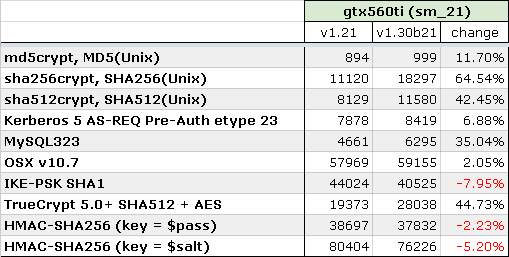 This means the increase of the performance depends on the GPU type. Every GPU type required different changes. It's mostly those chipsets that make the differences in cracking speed, after subtracting the effect that the shader count and clock stepping has. some of the algorithms became a bit slower. That is mostly because of driver changes that we were unable to compensate with more efficient code. Version by version it's more interesting to read your release notes as I sometimes learn more here in few min than reading other pages for hours. Thank you very much for your hard work! p.s. is R9 290X missing 'k' let's say on descrypt? somehow numbers not mach, or I don't know something as I have none of these cards? FirePro W5000 with new AMD Beta Driver and OclHashcat v1.30 is working ..
greatly appreciate all the hard work. thank you. just noticed descrypt on R9 290X is terrible. is that a typo or performance for descrypt really that bad?